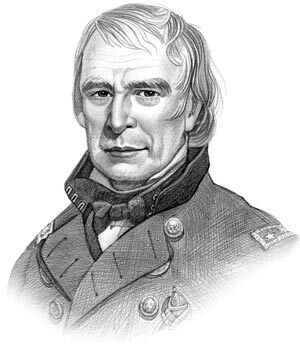 Summary of Zachary Taylor for Kids: "Old Rough and Ready"
Summary: The military hero Zachary Taylor (1784-1850), nicknamed "Old Rough and Ready", was the 12th American President and served in office from 1849-1850. The Presidency of Zachary Taylor spanned the period in United States history that encompasses the events of the Westward Expansion. President Zachary Taylor represented the Whig political party which influenced the domestic and foreign policies of his presidency. The major accomplishments and the famous, main events that occurred during the time that Zachary Taylor was president included the Apache Wars, the Clayton-Bulwer Treaty (1850) and the Galphin affair (1850). Zachary Taylor died suddenly from a stomach-related illness on July 9, 1850, aged 65. He had served just seventeen months in office and therefore had little impact on the events of the era. The next president was Millard Fillmore. The summary and fact file of Zachary Taylor provides handy, bitesize, short facts about his life. The Nickname of Zachary Taylor: "Old Rough and Ready"
The nickname of President Zachary Taylor provides an insight into how the man was viewed by the American public during his presidency. The meaning of the nickname "Old Rough and Ready" refers to his total disdain of tidy clothing, regardless of the occasion. The nickname "Old Zack" was a reference to his advancing age. The character traits of President Zachary Taylor can be described as unassuming, thoughtful, cautious, frank, direct and outspoken. It has been speculated that the Myers-Briggs personality type for Zachary Taylor is an ISTP (Introverted, Sensing, Thinking, Perceiving). A naturally quiet, insightful character focused on efficient operation and structure. Zachary Taylor Personality type: Observant, abrupt and authoritarian in nature. Summary of the Galphin scandal: The Galphin scandal involved a serious dispute between the government and the Galphin family regarding compensation for unresolved debts owed to the Galphin estate. George Crawford, the Secretary of War, and William Meredith the Secretary of the Treasury both important members of Zachary Taylor's cabinet were involved and became subject to a congressional investigation. In the midst of the Galphin scandal, President Zachary died on July 9, 1850 from a stomach-related illness and was replaced by vice president Millard Fillmore. Fillmore immediately replaced members of the cabinet involved in the scandal (William M. Meredith, George W. Crawford and Reverdy Johnson) with new appointments. The article on the accomplishments of Zachary Taylor provides an overview and summary of some of the most important events during his presidency. The following video will give you additional important history, facts and dates about the foreign and domestic political events of his administration.